Robot manufacturer tmsuk, Kyushu University and the Kanazawa Institute of Technology have teamed up to develop a robot that can sniff out the smells that accompany fire. A public demonstration of the robot's new abilities was held at Kyushu University on February 21. The researchers outfitted a 60-kilogram (132-pound), 112-centimeter (44-inch) tall Ubiko -- a tmsuk robot originally designed to serve as a temporary receptionist -- with a first-of-a-kind set of olfactory sensors specifically tuned to detect the odors of smoke and ash. In the test, Ubiko, which moves on wheels and has a slightly humanoid appearance (albeit with a pair of triangular feline ears atop its head), was tasked with patrolling four rooms, each with a different smell. One room smelled of perfume, one smelled of garlic, one smelled of cigarettes, and one was odorless. When the robot smelled the room with ashtrays, it identified it as likely to catch fire and sent a wireless message to security. Kiyoshi Toko, electronic engineering professor at Kyushu University, says, "We want to increase the accuracy of the sensors and create a fire-prevention robot that can detect subtle smells that humans cannot perceive." 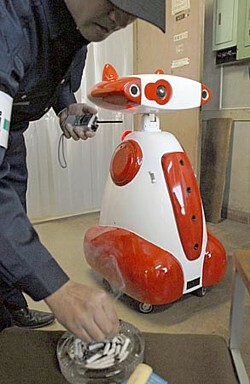 For now, the robot has no fire-fighting skills except the ability to alert the authorities when it detects a funny smell. This is probably a good thing in an office environment, for example, where Ubiko might wreak havoc by spraying fire retardant on heavy smokers or on innocent employees who happen to visit smoky restaurants during their lunch breaks. I love this robot. Just like the yellow snowplow you featured awhile back, it is the cutest thing! Alas, however, I don't need such a robot. I'm allergic to cigarette smoke and start sneezing and wheezing whenever I'm anywhere near it. Still, I can see how this would be a nifty smoke detector.